Information reaching the PoliticsNGR newsdesk reveals that security agents have confirmed spotting Nnamdi Kanu in the company of his wife in Ghana. Kanu, the leader of the Indigenous people of Biafra(IPOB) was last seen in public in September 2017 before the military launched ‘Operation python Dance II’, an exercise aimed at stopping the pro-secession movement in the south-east. Since the military raided his home in Abia state, there has been speculation that he might have been arrested and possibly killed but recent developments prove otherwise. 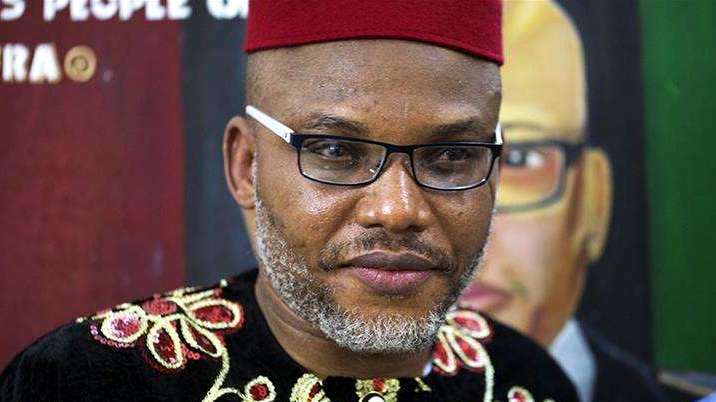 According to TheCable, Intelligence reports by security agents reveal that Kanu escaped to Ghana through the Niger Delta creeks using a boat manned by militants at the height of Python Dance II exercise. according to the reports, Kanu is regularly seen at Kenzo Bar and IBG saloon in Accra, disguised in a baseball cap and usually in company with his wife, Uchechi.He is said to live in an area called Cantonment, also in Accra, at an estate called “Arabella” and also said to regularly patronize suya joints in remote parts of the city.